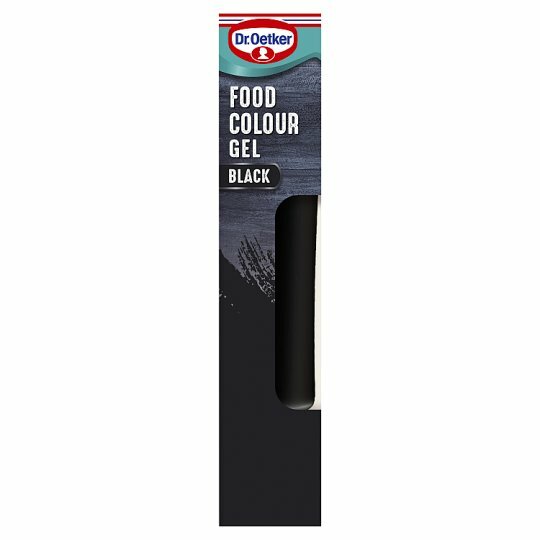 Dr. Oetker Extra Strong Black Food Colour Gel delivers strong, bright colours that keep their colour during baking. Food colour gels are a great alternative to colouring liquids, and work great when colouring fondant icing or making a sugar paste. Developed in a large tub, with higher concentrate, the Dr. Oetker colour gels give you long lasting results. The easy-to-use colours can be used one drop at a time to create pastel shades, or go out with a bang and create the boldest rainbow cake ever! Why not use our Black Food Colouring for the finer details on your bake? Such as facial features and finelining patterns. Store in a cool, dry and dark place., Best Before End See base. Snip end of tube with scissors. Add small amounts of Food Colour Gel, stir well between each addition. For sugarpaste, knead well between each addition. WARNING Not suitable for children under 36 months - choking hazard.